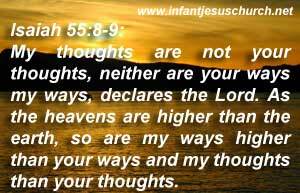 Isaiah 55:8-9: My thoughts are not your thoughts, neither are your ways my ways," declares the Lord. "As the heavens are higher than the earth, so are my ways higher than your ways and my thoughts than your thoughts. Heavenly Father, thank you very much for being so patient with us when we cannot fully understand/realize and appreciate your holy and transcendent character/love. Thank you for sending Jesus so we can know you better and trust you to know us better than we know ourselves. We look forward to seeing you face to face when Jesus comes to bring us home. Until that day, please know we love you. In the name of Infant Jesus we offer our thanks and praise to you. Amen. People often find difficult to pardon to others. They harbor malice, they seek retaliate, they are slow to forgive an injury. Not so with God. He harbors no malice, He has no desire of revenge, He has no reluctance to forgive. No matter how hard we try to perceive the awesomeness of God, He is still God and we are not. We must forever remember that the original, and still essential, sin was to try to become like God in terms of knowledge and understanding. We are to understand God, but we can never fully know everything about God. We are to take on His character, but we cannot approach His majesty, righteousness, or holiness on our own. This is both exciting and frustrating. But, the promise remains that one day we will be like him and see him as he is and know fully even as we are fully known. It may refer to the number of offences. People, if they forgive once, are slow to forgive a 2nd time, and still more reluctant to forgive a 3rd time, and if the offence is often repeated they refuse to forgive altogether. Not so with God. No matter how often we have violated his law, yet be can multiply forgiveness in proportion to our faults.